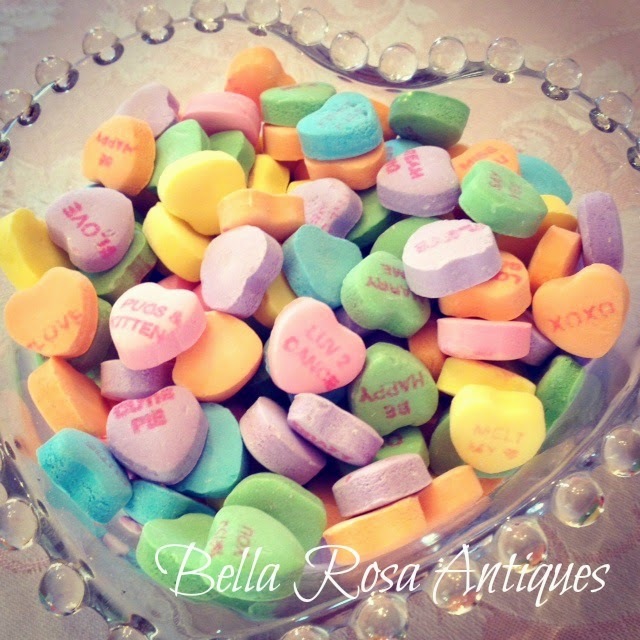 Bella Rosa Antiques: SweetHearts and a 25% Off SUPER BOWL Sale Going on Now! SweetHearts and a 25% Off SUPER BOWL Sale Going on Now! What do you feel when you see these small bits of sugary love? They bring me right back to being a kid again. They are literally eye candy....bringing pops of color, too. And as I was loading this photo onto the blog I noticed the center heart reads: Luv 2 Dance. That couldn't be more true about me. Did you know dancing is actually my first love? I'm excited to be leading a dance clinic/class at Bebe's school this spring! Have a super weekend... remember, if football ain't your thang, you can always hop on over to my Super Bowl Sale at BellaRosaAntiques.com and receive 25% off this weekend through Monday only. It's like getting free shipping! In order to receive the discount you must use the link. Remember these very well. Loved seeing if I got cute one from a boy.